Getting back home from Stewart Sunday afternoon to find the house unseeingly quite was kind of unexpected but I found out that now all the kids are sick. Some virus has made it's way that has everyone sick - yikes. I hope I don't get it. However, the virus might not be the end of me but my should/rotator cuff might be. I may have injured my rotator cuff last summer and had to give up riding rigid off road because afterwards my shoulder hurt too much. 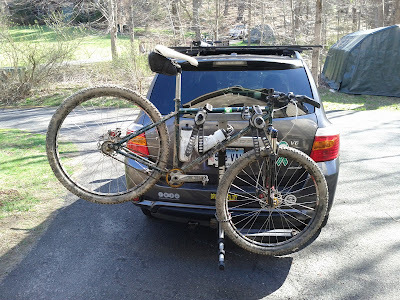 Yesterday, while transitioning from the Beaver Pond to the Ant Hill singletrack I hit rooty section and went OTB. Without even thinking I came out of the pedals and landed on my left side, which includes the bad shoulder and hit the ground with a thud. When I got up, I could feel the soreness start to take hold but couldn't think about it because I still had 13 more miles to ride. But waking up this morning ... oh man. I am going to take it easy this week and try a bike commute on Wednesday to see how I feel. But given how it feels right now I could be out of the race on Sunday.